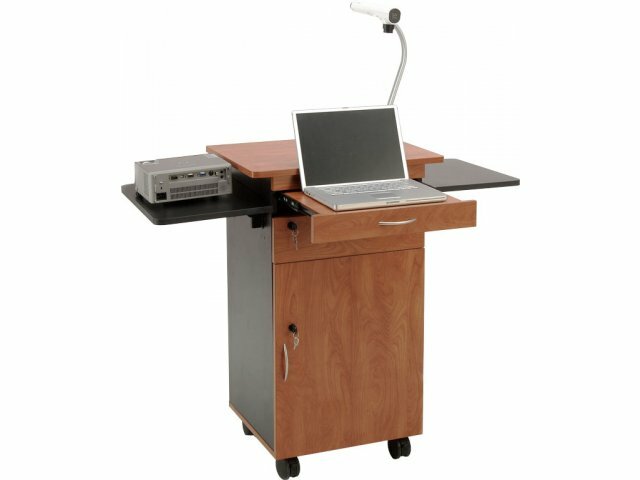 Looking for an AV cart that can house all of the multimedia tools you need for your presentation in easily-accessible places? You can have it all with the Multimedia AV Cart. You can keep a document camera, laptop and projector in ready-to-use position on the slide-out laptop shelf and dual flip-up shelves. When it is time to move the cart, simply place all of the electronics in the secure locking storage cabinet and stow away the shelves. 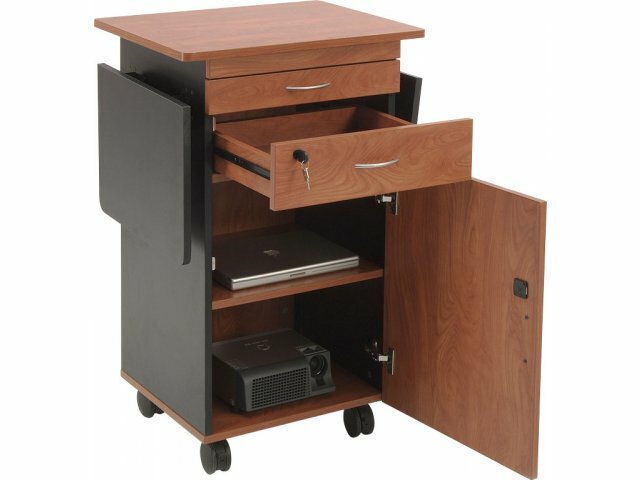 This AV cart features an additional locking drawer below the large work surface, for valuables or smaller accessories. Its outstanding features are complemented by an attractive professional design befitting a school or office. 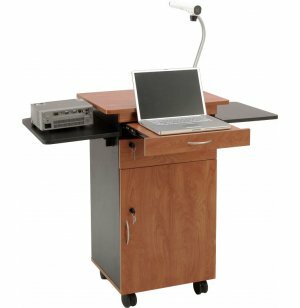 Smart Design: The front slide-out laptop shelf (measures 16"W x 13"D) and dual flip-up shelves on either side keep a document camera, laptop and projector simultaneously accessible. Flip-up shelf measures 18"W x 14"D.
Ample Surface: The large top surface is big enough to fit leading document cameras. Secure Storage: This cart features a locking drawer (15x15x2.5"H) to store and secure valuables, and a locking storage cabinet with an adjustable-height shelf. Storage cabinet measures 18"W x 16.5"D x 23"H.
Durable Materials: Built with high-pressure laminate on particle board.